Salam and selamat petang…, just got back from picking my daugthter from her club activity. So glad that it is Thursday evening which means….weekend is here. Hari ni dah ketandusan idea untuk masak, fikir punya fikir, at last decided to make Laksa Kelate and Laksam. Recipe for this homemade Laksa and Laksam I got it from my friend Zue, thanks a lot for sharing. Kuah Laksa ni pulak is recipe that I got from my sister in law. Laksam : Bancuh tepung beras dan air suam hingga sebati. Sapu minyak pada tudung periuk dan letakkan dlm kukusan selama 2 min, kemudian tuang 1/4 cawan adunan keatas tudung periuk tadi dan kukus selama 4-5 min. Angkat and gulung. Ulang process hingga adunan habis. Laksa : Satukan kedua2 tepung dan garam, kacau agar semuanya bercampur. Masukkan air dan kacau dengan senduk kayu hingga sebati. Bila adunan agak2 suam, kepal dan masukkan ke dalam acuan muruku dan pusing ke dalam air mendidih yang di campur sedikit minyak. Bila timbul, angkat dan tos. Kuah Laksa : Blend kesemua bahan yg bertanda* hingga hancur, masukkan dalam periuk, masuk santan, gula dan garam secukup rasa. Kacau hingga mendidih. Angkat dan hidangkan dengan ulam. 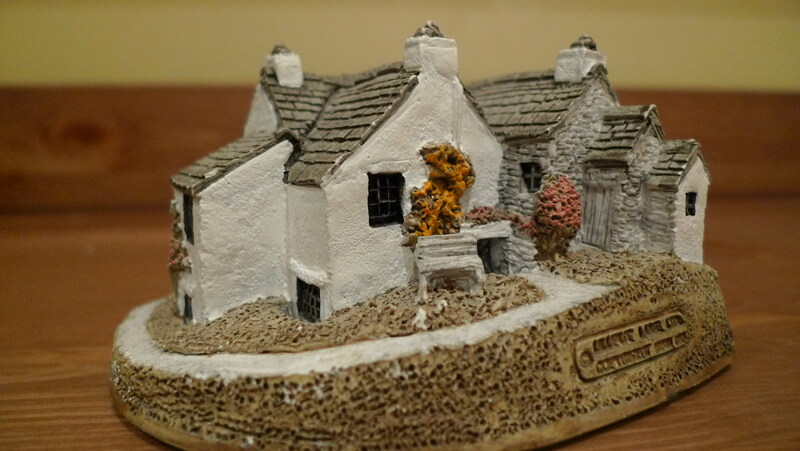 Lilliput Lane miniatures and cottages ada banyak series or collection, for example Welsh Collection, The Scotland Collection, and The British Collection and so on. 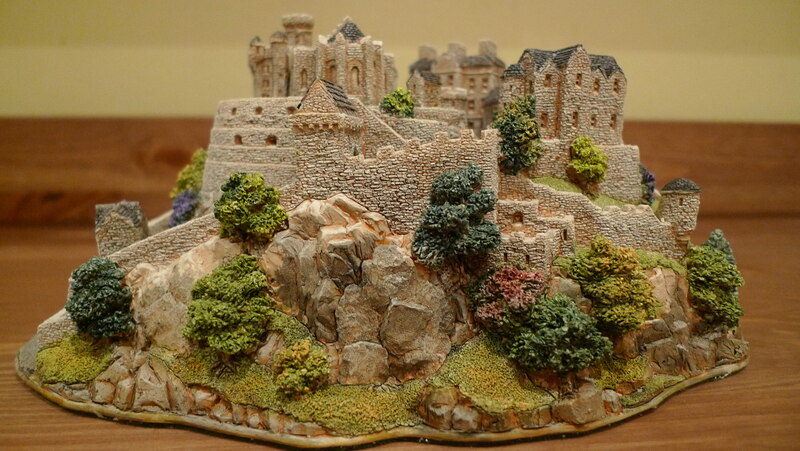 This one is Lilliput Lane Heritage collection – Edinburgh Castle. I got this as my Anniversary present this year…. This castle is bigger than the cottages yang I have posted before, the size is 18L x 9H x 12W. 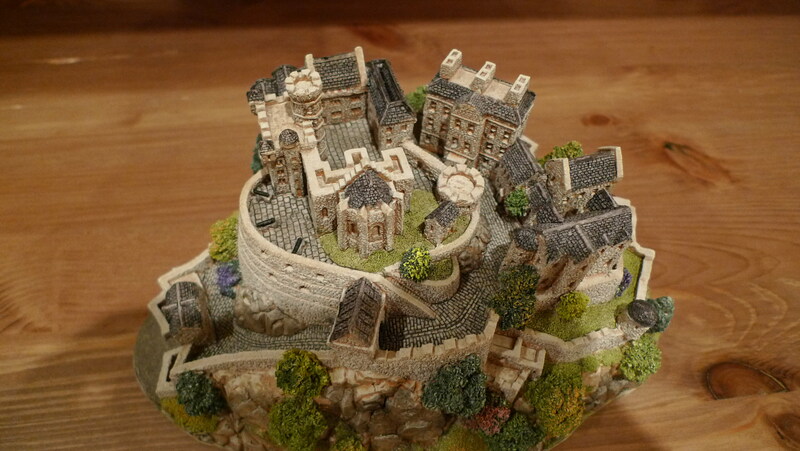 This miniature shows wealth of detail from the massive rocks on which this castle sits to the gatehouse and the winding entrance road up to the ramparts which look out over the City of Edinburgh. Do you know that Edinburgh Castle sits on the plug of an extinct volcano? Mmmm… that’s right….well, I just got to know this few weeks ago, and in medieval times, this castle is used to defend and shelter Edinburgh’s citizens from invaders. Resipi ni I ambik from myresipi but I forgot from whom…walaubagaimanapun I’m really glad that I found this recipe coz it is sooo easy and sedap. Untuk membuat caramel, masak 1 cup of sugar dalam periuk hingga perang. Padamkan api dan masukkan air panas. Kemudian masukkan 1/2 cup of sugar dan butter, kacau hingga gula hancur. Sejukkan. Dalam manguk, beat eggs, flour, milk and soda bicarbonate till all combine. Bila caramel mixture dah sejuk, combine kedua-dua mixture and leave for 30 mins. 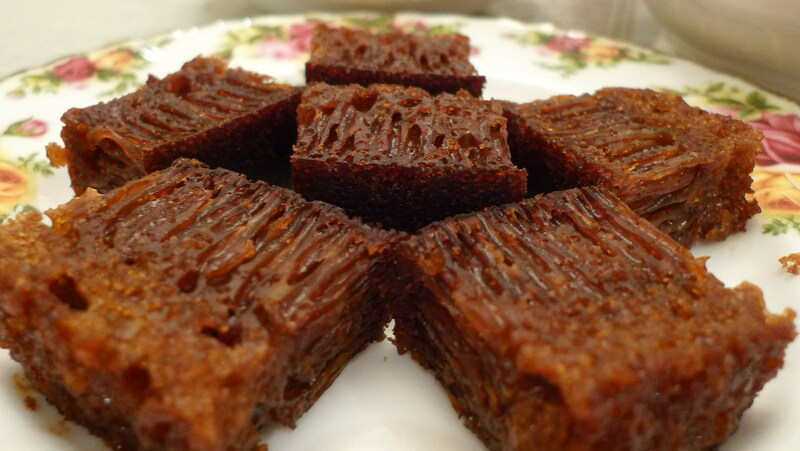 Masukkan dalam loyang and bake for 30 – 40 mins @ 160C. Resipi tart nenas ni I got it from my auntie years ago tapi tak pernah try because tart nenas ni easily available kat Malaysia. Well….this year is our third raya in Kuwait and I miss tart nenas soooo much, so I give it a try and alhamdulillah, it turned out OK and my hubby loves it. Dough : Masukkan buttter and 3 types of flour dalam bowl and mix together till resemble breadcrumbs. Dalam bekas lain, pukul telur, salt and sugar hinggan sugar dissolve. OK, sekarang bolehlah tuang wet mixture ke dalam dry mixture and mix them hingga soft dough is formed. You might not need all of the wet mixture. Jem nenas : Parut nenas and then tapis parutan tadi utk mengeluarkan air nenas tadi. Masukkan parutan nenas, gula dan cengkih dalam periuk and masak hingga pekat dan berkilat. Angkat and sejukkan. Bila sejuk bentukkan menjadi small ball. 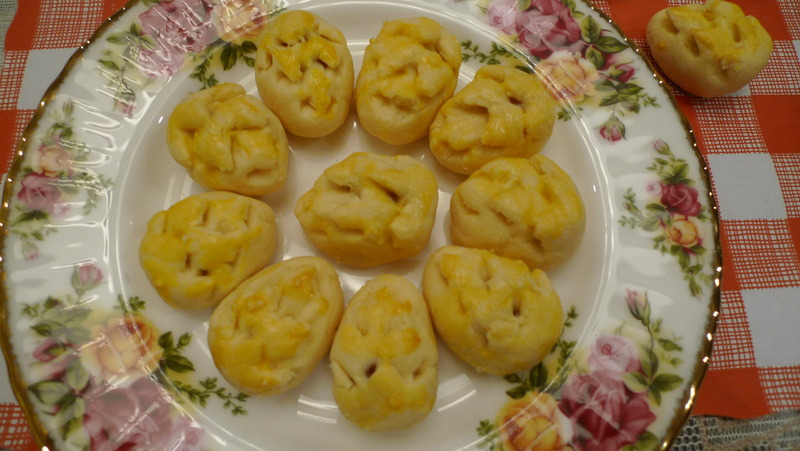 Tart Nenas : Ambil sedikit jem nenas dan balut dengan sedikit dough,bentukkan bujur macam daun and then gunting dough tadi so that it resemble nenas. Sapu atasnya dgn egg wash and bakar dlm oven @ 175 C for about 20 mins or until dough kekuningan. Cool on the rack before storing. Salam…. Dah masak ke belum? Hari ni tak de idea nak masak apa, so…kita tengok2 lah rumah comel ni dulu ye…hopefully idea tu datanglah lepas ni.. The first cottage yang I nak show today is called Lace Lane cottage. OK…the second cottage for today’s viewing is called Dove Cottage. 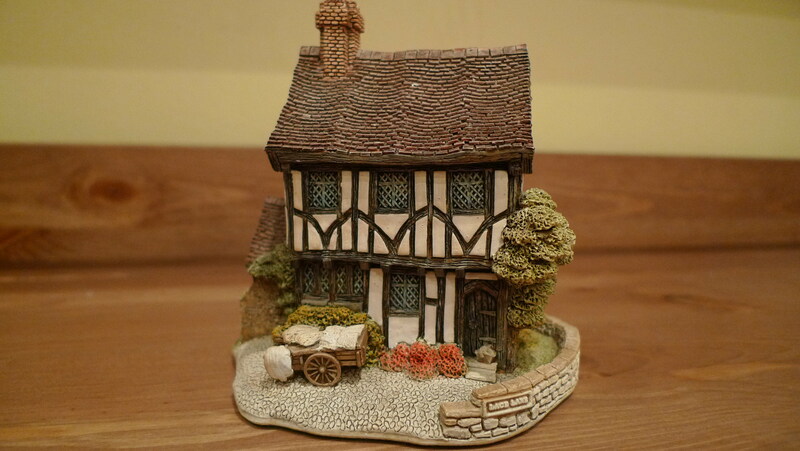 Ok…the last cottage for today is called Victoria Cottage. 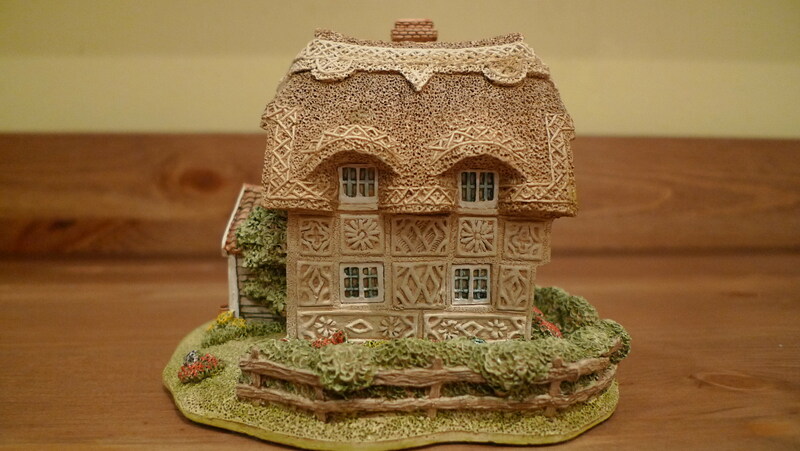 This cottage is introduced in 1989 and discontinued in 1993. This design is based on a typical house of the 1880s. Well, that’s all for today kids… he he he, time to start cooking….see u later, alligator!!!!! Salam to everyone. 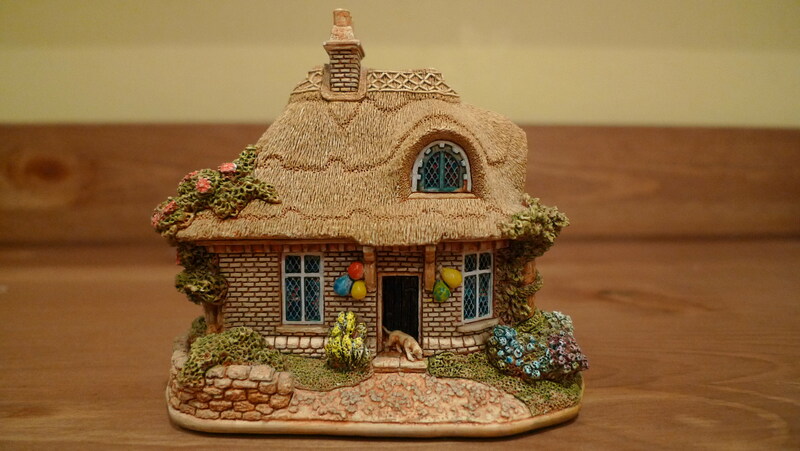 Today I nak cerita sikit pasal one or two cottages that I have in my collection….First one is called Birthday cottage…. well, not that I got this on my birthday…my hubby got this for me from ebay. This cottage was built based on a house somewhere in Suffolk, England. Since this cottage is called Birthday cottage, kat depan and belakang dia ada few balloons tied to the tiang and pintu. Really cute and pintu belakang dia terbuka sikit with a dog coming out from the house. Can you see the dog???? OK, next cottage yang I nak tunjuk is called Tea Caddy Cottage, this cottage is named after a house in Hadleigh Road and I think this house in on a high land. The house looks like ada 3 levels with big tree at the back of the house….This cottage was built in 1994. 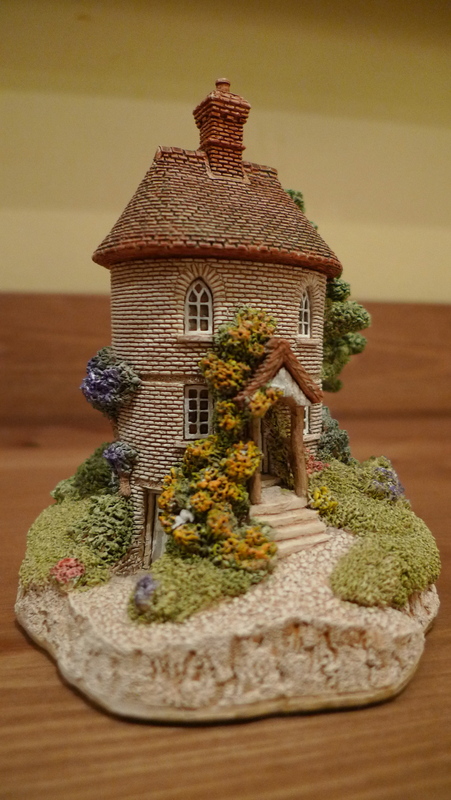 The Lilliput Lane collection was begun in 1982 by sculptor David Tate in England’s Lake District. 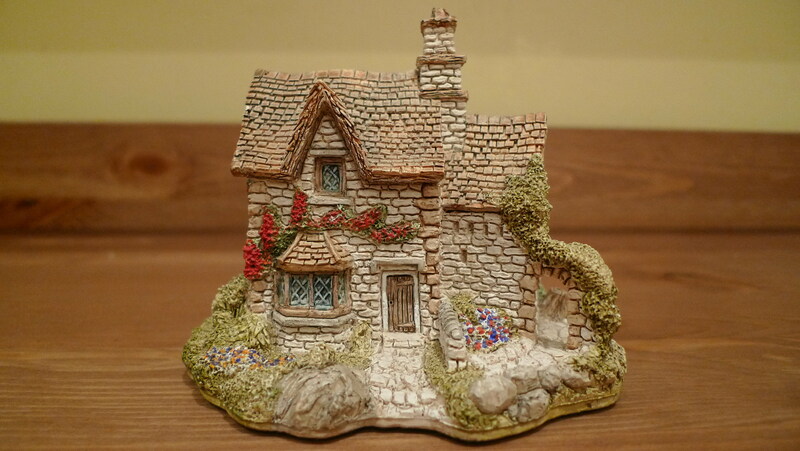 Lilliput lane leads the world in the production of handcrafted, hand-painted miniature cottages. 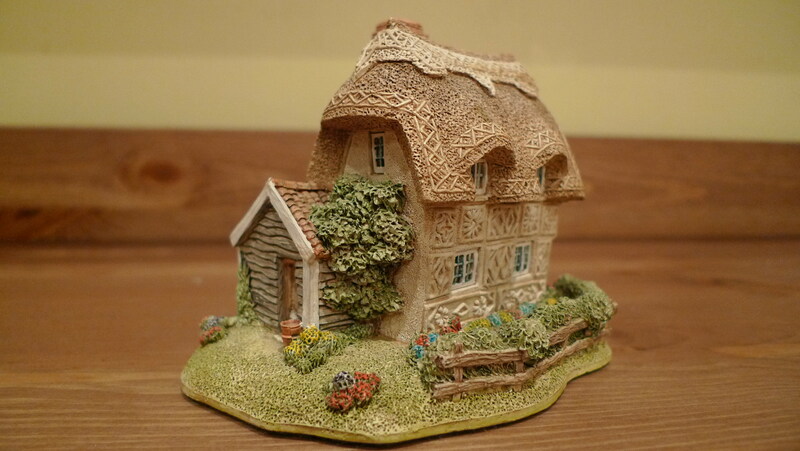 All Lilliput lane models are produced in the United Kingdom. 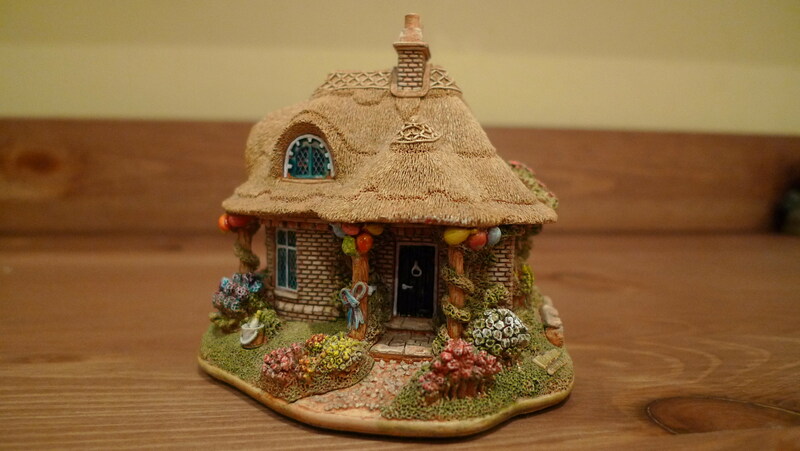 How can we tell that it is a Lilliput Lane collection? Well, all of the cottages feature labels on the green baize (fabric) base which feature the name of the piece and they have a backstamp somewhere on the side of the piece. OK, enough with that. There is another piece of my collection. The name of this cottage is FINCHINGFIELDS. This cottage is named after a village in Essex. Finchingfields is a common tourist coach destination because it is generally regarded as being very “pretty”. In fact it has won competitions for that in the past and has been described as “the most photographed village in England”.